John Ross “Is Christmas Just for Children?” from Stephen Sizer on Vimeo. John Ross speaking to a Men’s Breakfast at Christ Church, Virginia Water, Surrey in December 2010. This entry was posted in Bible, children, Evangelicalism, Evangelism, Theology on December 12, 2010 by Stephen Sizer. Shaun the Lost Sheep from Stephen Sizer on Vimeo. This is the story of Shaun the Sheep. Shaun was a short-sighted Sheep. He is always wandering off and getting lost. He lives with his friends and is a happy sheep. His master loves him and cares for him and provides everything he needs. But Shaun is always wandering off and getting lost. His master calls him and searches for him and eventually finds him and brings him home rejoicing. Shaun loves to help out in the church. In the office and the kitchen. Making tea and coffee and washing up. He loves making music and playing with computers and distracting the staff. But Shaun is a short-sighted Sheep. He is always wandering off and getting lost. His master calls him and searches for him. He eventually finds Shaun and brings him home rejoicing. Shaun loves to be in the Church and help with the flowers and straighten the chairs. But Shaun is a short-sighted Sheep. He is always wandering off and getting lost. Then one day Shaun gets really lost and is put in the lost property box. Oh dear. His master calls him and searches for him but cannot find him. His master is very, very sad. So his master leaves his other 99 sheep and goes in search of Shaun. He searches very high and low. Eventually he finds Shaun, sitting in a charity shop window. He looks very sad and lonely. His master goes into the shop and gladly pays the price to buy Shaun back. His master is so happy to find Shaun. He brings him home rejoicing. And that’s the story of Shaun the Sheep. Shaun the short sighted sheep who was lost and redeemed. His master paid to get him back. That is what ‘redeem’ means – to pay for something you really want back. You know we are like Shaun the sheep. Sooner or later we all get lost and lose our way. The Bible says, “we all like sheep have gone astray” (Isaiah 53:6). But we don’t have to stay lost. Jesus said “I am the good shepherd. The good shepherd lays down his life for the sheep” (John 10:11). That is how he ‘redeemed’ us. He bought us with his life. Jesus wants us to listen to him and come to him and stay close to him so that we will never get lost again. Lets say a prayer to thank Jesus for redeeming us. Thank you Lord Jesus for loving us so much that you gave your life to redeem us, to buy us back. Help us to listen to your voice through the Bible. Please purify us and make us a people that are your very own, eager to do what is good. In Jesus name. This entry was posted in Bible, children on July 4, 2010 by Stephen Sizer. Our daughter Katie has just published her first book of poetry. “I have, in recent years, learned an extremely valuable lesson about the importance and rewards of perseverance. 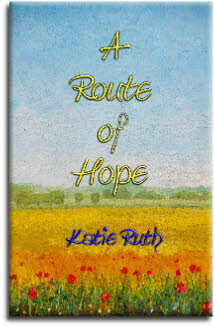 ‘A Route of Hope’ is a collection of my poetry which has been published with a prayer that I might be able to encourage people. At least 10% of the profits from the book are being donated to Umthombo and their work among homeless street children in Durban, South Africa. This entry was posted in Bible, children and tagged A Route of Hope, hope, Katie Ruth, poetry on November 15, 2009 by Stephen Sizer. Harvest – Past, Present and Future from Stephen Sizer on Vimeo. This entry was posted in Bible, children, Sermons, Theology on October 4, 2009 by Stephen Sizer. This entry was posted in children, Church of England and tagged Colin Buchanan on May 15, 2009 by Stephen Sizer.